It all began with five rumbly tumblys. Lily and her friend were babysitting my three little kids, and it was time for dinner. The girls decided to make quesadillas while the little kids fought with each other, waited impatiently, and complained. From the contents of the garbage can, it looks like they had a bit of a rough start--a few shredded tortillas and a few "dark" ones that I'm sure the kids rejected as "burned." This is where the story gets exciting. The next quesadilla was cooking when some cheese that had fallen off the side of the skillet suddenly caught fire. I wish I'd been here to see this part, because it was enough flame to send the girls into a complete panic. Lily ran for the fire extinguisher, and with one puff of fire-retardant chemicals, the fire was out. But the kitchen was a disaster. I've never used a fire extinguisher (I harbor a secret desire to have an emergency that requires me use one), but I can attest to how much mess they leave after use. It was horrible. Like any responsible babysitters, they began cleaning up the extinguisher dust while the kids continued to fight and complain that they were starving. At this point, food became secondary to their need to clean up before we got home, so they quickly wiped down the stove, the counter, the walls, and everything that had been on the counter in the line of fire. This is where the story gets bloody. I got a set of Wusthof knives for Christmas, and the kids have been warned that they are extremely sharp and that they shouldn't ever touch them. The knife block was full of extinguisher dust, so after removing the knives and wiping down the block, Lily began to carefully wipe down each knife. She was wiping down one of the blades, but she was unaware how sharp it really is. 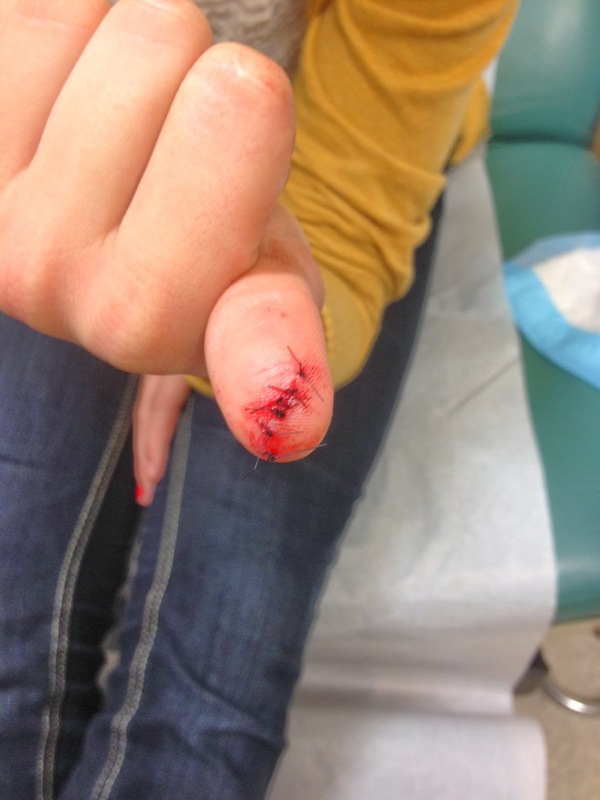 That knife cut through two layers of the rag and sliced open her left thumb. This is where the story gets hysterical (and not the LOL kind). She began screaming and crying, dripping blood all over the kitchen and herself. She tried to call two of our neighbors who are doctors, but they were on a double date--ironic, no? Lucky for all of us, Brad and I walked in the door less than two minutes later. Brad entered the house first, and through the open door I could hear inconsolable crying and a few choppy words: fire, extinguisher, knife, blood, so sorry. It was strange to me how apologetic Lily was for making a mess with the fire extinguisher and for having the kitchen so messy when we returned--like I even cared about any of that. Maybe she was in a bit of shock from the knife wound, but I was very grateful that she thought to use the extinguisher to put out a fire instead of trying something else that may not have worked. It took us five minutes or so to get her calmed down enough that we could reason with her and look at the cut. I knew immediately that it needed stitches, but the little kids were still hungry and complaining and the kitchen was a mess. I volunteered to stay home to clean and feed while Brad took the big girls to Urgent Care. Six stitches and twenty minutes later, they were back. This is is the moral of the story. It's a great story, one that will be repeated in our family many times over the years, I'm sure. "Remember that time Lily was making quesadillas and she set the kitchen on fire . . ."
As the mom, I learned something different. I see Lily through different eyes now. I am impressed with her ability to think quickly in an emergency. She didn't hesitate and freak out when a fire started. She headed straight for the extinguisher and put out the fire. I am impressed that she worried about the dust and the mess and wanted it all cleaned up before we returned. I am impressed that they tried to call neighbors who could help her, instead of hysterically calling me who couldn't help her. Oh my goodness...I can so totally see this happening to Leslie...especially the screaming about the blood part! BUT, one big difference, I'm pretty certain, Leslie wouldn't have the foresight to find the fire extinguisher...she'd just run out of the house! Reminds me that I need to get my knives sharpened. She did use some great judgment. PS. I have exactly two really sharp knives, and I am scared to death of them. Seriously, I never even use the things! Oh my gosh! Glad she was okay in the end and that you guys got home when you did. That is a sharp knife!